As a mother, you want to make sure your baby is always comfortable, even while on the go. This is why it's important to have the best mattress for Graco Pack and Play, which can ideally be set up anywhere, and take care of your child's needs. A Graco Pack and Play is portable baby station that allows you to give your baby a place to play or nap while you are travelling away from home. For today's busy parents, anything that promises to make life a little simpler is worth checking out. Graco Pack and Play is one of the most convenient items for parents with newborns or young ones up to the age of two. Graco Pack and Play is available in a variety of designs and configurations, which caters for different needs and situations. Some offer more space to serve as a playpen, while others feature bassinets, changing stations, infant bouncers, and more. In addition, they are much cheaper compared to buying a full crib. Such features make Graco Pack and Play godsend for busy parents, since they can step away from the when needed to attend to an urgent task, knowing exactly where the child is and what they are doing. Keep in mind that Pack N Plays are usually safe and almost impossible for children to escape from, so you don't have to constantly keep an eye on them. Moreover, you can take your Pack N Play with you anywhere, since they are very light ad highly portable. You never know if you're going to find an appropriate changing station for your child outside your home, or when they are going to take a nap, especially if you are travelling away from your town or state. You can bring a Pack N Play with you, so that you are always reassured that your baby has what they need. It's also a great place to keep your baby occupied, entertained, and store their toys. Since you can't possibly keep your baby preoccupied all of the time, it's quite helpful to have a few toys available for them, as they can promote the growth and development of their cognition, fine motor skills, and more. Since most people use Pack N Plays in their homes and while travelling rather than a standard crib, it's very important to pay careful attention when choosing Graco Pack and Play ones. One of the first things you need to keep in mind when choosing mattresses for your Pack N Play is finding options that fit into your style of Pack N Play. Not every version of mattresses will be of the same size. 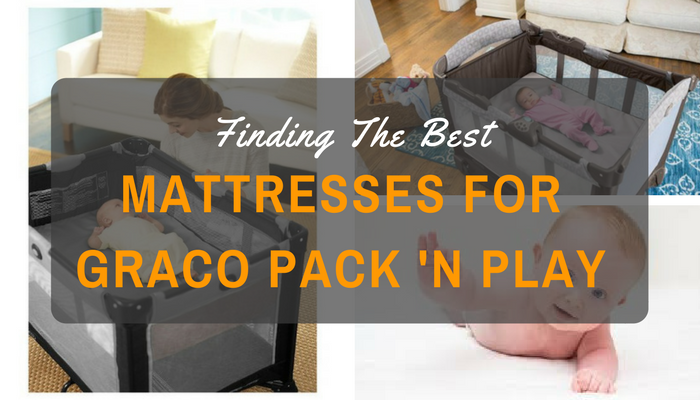 You need to find the mattress that fits the dimensions of your Pack N Play. When it comes to comfort, you need to consider the construction of the mattress. Ideally, it should be both comfortable and supportive for your baby. Make sure that it can be assembled in such a way that it can handle and support their little, delicate body safely. Think about the materials used in the construction, the thickness of the mattress, and other extra comfort features. Of course, you want to make sure that the mattress is durable. As your baby grows, the mattress will experience a good amount of wear and tear. As such, you want to make sure that the construction and materials of the mattress can handle it. As you look for your new Pack N Play mattress, look for materials that are antibacterial, hypoallergenic, or certified to be free of harmful substances like phthalates and lead. It's always good to know that your child is sleeping in a safe environment. Ensure that the mattress has passed the Federal Flammability standards. The standards you should be looking for are the 16 CFR 1633 and 1632. The tests identify the various hazardous substances released when the mattress is burned, and these can be as deadly as the flames. Do take your time to do your due diligence, lives are at stake here. It might seem obvious to ensure the mattress is lightweight and portable enough so that you can take it with you wherever you take your Pack N Play. Well, it's still worth mentioning that the beauty of Pack N Play is to make sure that you can take it with you. Stay away from mattresses that are heavy, or those that are difficult to handle. One effective way is to go through online reviews to see if the portability of a certain product is an issue or not. You can also use the materials to approximate the weight. In general, foam is light, while vinyl and cloth are a bit heavier. Springs add more rigidity and weight. Besides the six considerations listed above, it's also important to examine the thickness of your Pack N Play mattress to determine the kind of sheets you need to buy, as well as how easy it is to clean your new mattress. You can also combine with pillow if you want to enjoy best feelings. This is one of the best Graco Pack and Play Mattresses you can find on the market today. Essentially, it's not just a mattress but a perfect playground for your baby. 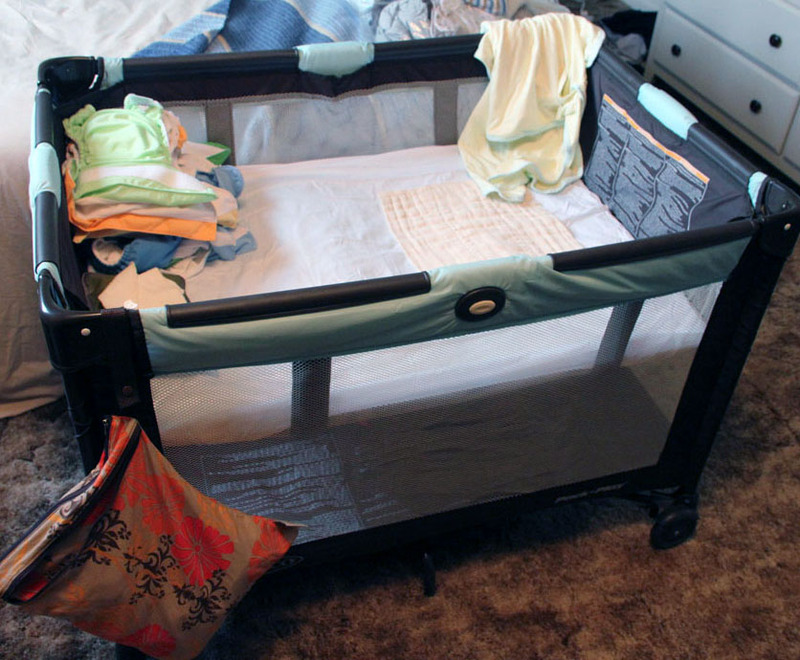 For starters, the mattress fits perfectly in the Graco Pack and Play, it's water proof and wipes clean. The mattress is made up of 90% foam and 10% vinyl, and 100% made in the USA. It complies with the CFR 16 1633/1632, and also passes the lead and toxicity tests. It's antibacterial waterproof cover can be wiped clean using mild soap and water, to prevent odor, mold, and mildew. Waterproof, antibacterial, lock stitched cover that effectively prevent mildew, mold, and odor from seeping inside the mattress. It's not suitable for babies weighing more than 25 pounds. This is one of the super affordable options for parents who want to keep the costs low, and at the same time want to have a high-quality, durable product that meets their preferences and baby's needs. In fact, some of the other alternatives that have the same features, durability, and quality would generally cost you about twice what this product does. It's a typical 3" high density mattress made up of foam (90%) and Vinyl (10%) providing premium quality and maximum comfort. 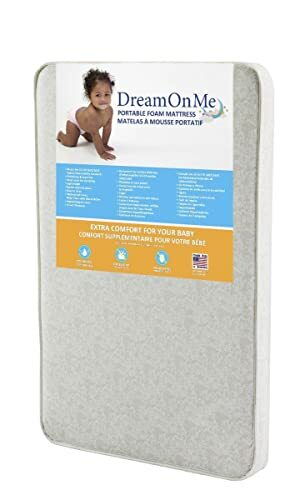 With dimensions of 25.5 x 37.5 x 3 inches, the product only weighs 2 pounds, making it perfect for your Pack N Play, and much easy for you to carry around. The construction materials are highly durable, making it a one-time investment. Since your baby is probably going to spend about 3 years on the crib, this mattress is a perfect solution to cut on your future spending. Some parents claim the product doesn't fit into the cribs of some brands. 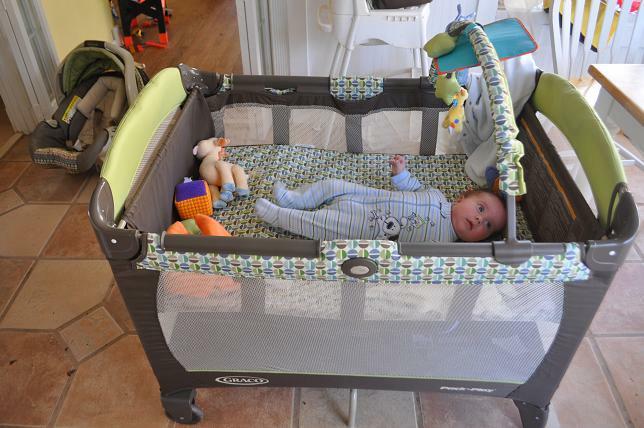 However, the crib works perfectly well with Graco play Yards and most other brands. The Millard Baby Crib is specially designed to provide the ultimate comfort for your baby. It features a ventilated memory foam and a removable waterproof Non-Slip Cover, made of 65-Percent cotton. 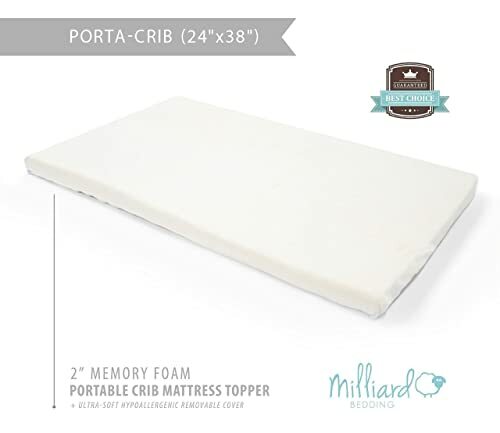 The mattress topper can perfectly fit a 38 x 24 x 2 inches portable sized cribs. The memory foam ensures that you baby stays comfortable, and gets a better, healthier night's sleep. This is because it contours perfectly around the body of the child, providing maximum comfort, and reducing tossing and turning when the baby is asleep. A waterproof, removable 65% cotton zipper, for liquid protection and easy care/maintenance. The cover is machine-washable, and even dryable to make the care easy and effortless. The memory foam reduces tossing and turning, which improves the quality of the child's sleep. The smell of the off-gassing chemicals can be a bit string for some. But the smell wears off in just a few hours. This is one of the most recommended must-have baby gear products. 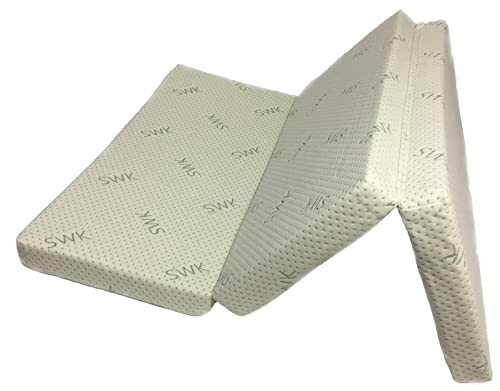 The smart Playard mattress topper is designed to protect your baby from the harsh surface level abrasions, and to be extraordinarily comfortable and cute for the baby. This mattress essentially transforms your Playard into a cozy crib, helping your baby and perhaps even you to get more sleep. Since it matches the density of daddy's or mommy's chest, it can easily become one of the favorite places for your baby to sleep. 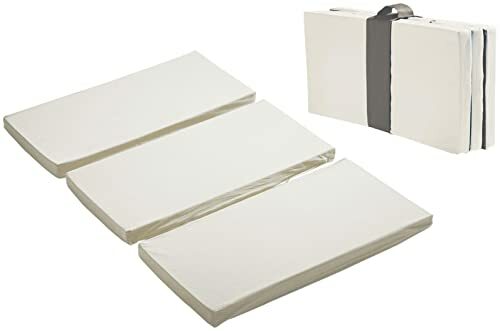 Perfect for preventing plagiocephaly (flat spots in the baby' head) as it keeps the baby off the hard surfaces and ideally on the mattress topper. Compatible with most of the playards. It can fit perfectly on the standard playards, including Graco, Nuna Sena, Evenflo, Chicco, Boppy, Aprica, Baby Trend, Eddie Bauer, Safety 1st, Cosco, Bright Starts, Arms Reach Original, Nature's Purest Comfort, and more. It's free of flame retardants and other toxic chemicals, passing all of the federal safety standards. Some claim the initial smell is horrendous. But it wears off after sometime. This foldable pack and play mattress is made with babies in mind. 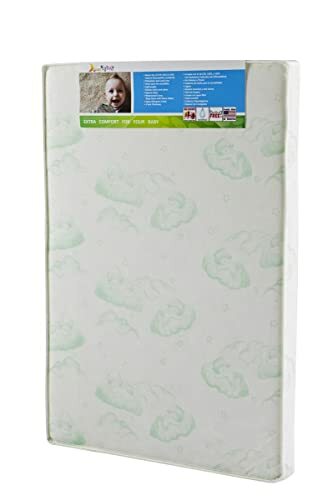 It's one of the best folding mattresses you can find for babies or young children. While it comes at 2 inches thick, it shouldn't be an issue because it's meat for toddlers to nap or paly on. The built is a supportive latex foam, which is dense and comfortable. The cover is made up of ultra-soft bamboo, which is hypoallergenic and free of any unnatural chemical and ingredients, making it safe for infants. The cover has a food-grade, waterproof liner, which ensures the mattress is safe from any spills or water damage. It's a fold and go solution for Pack and Plays, meaning is can easily fold up, just as your Pack and Play does. The mattress includes a travel bag! A food-grade, waterproof cover keeps the mattress clean in case of spills. it's also machine washable. The natural latex foam is extremely comfortable and supportive for the baby. The natural latex foam makes the product environmentally friendly, as it's sustainable harvested from rubber trees.